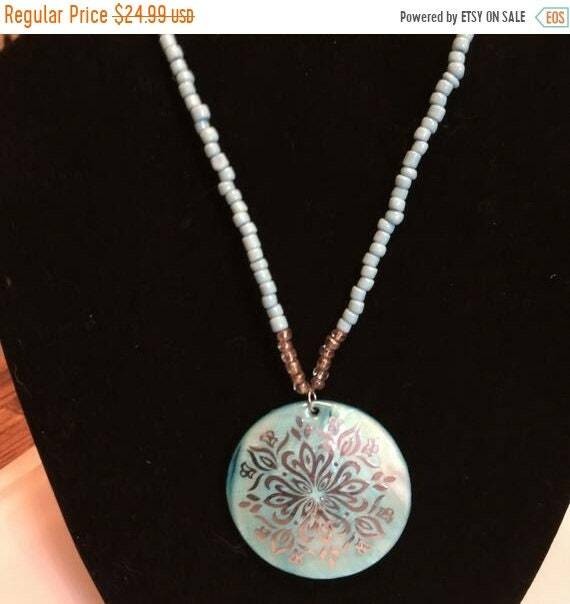 This necklace consists of a 2"Circle of Blue Mother of Pearl, with a beautiful Silver Design on it, while hanging from turquoise beading that is 20" Long. Turquoise is an old stone known for its healing powers. It soothes emotions. It gives energy to the soul, and gives peace of mind to the wearer. This beautiful necklace has such vivid colors! It was carefully packaged. The shipping was prompt. This seller is first-rate! I would definitely shop here again! I love the beachy theme of this gorgeous necklace! It was skillfully packaged. It was shipped speedily. This shop is wonderful! The necklace is lovely! It was packaged well. It was shipped quickly. This seller is excellent! I would highly recommend this shop! I was ecstatic about receiving this lovely necklace! The craftsmanship and creativity are marvelous! It was packaged in an attractive black & gold pouch. It was shipped fast. This seller is wonderful! I would absolutely shop here again!